State Bank of India Recruitment 2019 April - Probationary Officer post:- Welcome to North East India's No. 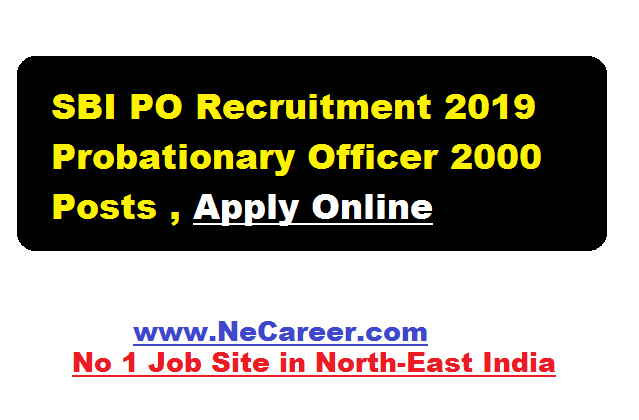 1 Job Portal NeCareer.com .Finally the most awaited SBI PO recruitment 2019 notification is out.This time SBI PO recruitment 2019 comes with 2000 vacancies. According to the recruitment applications are invited from eligible Indian Citizens for appointment as Probationary Officers (POs) in State Bank of India. Candidates selected are liable to be posted anywhere in India. Find more details in below sections. Essential Academic Qualification: (as on 31.08.2019): Candidates must have done Graduation in any discipline from a recognized University or any equivalent qualification recognized as such by the Central Government. Those who are in the Final Year/ Semester of their Graduation may also apply provisionally subject to the condition that, if called for interview, they will have to produce proof of having passed the graduation examination on or before 31.08.2019. Candidates having Integrated Dual Degree (IDD) certificate should ensure that the date of passing the IDD is on or before 31.08.2019. Candidates possessing qualification of Chartered Accountant may also apply. been born not later than 01.04.1998 and not earlier than 02.04.1989 (both days inclusive) Relaxation in Upper age limit as per govt rules. Selection criteria for Main Examination: Category wise merit list will be drawn on the basis of the aggregate marks scored in the Preliminary Exam. There will be no sectional cut-off. Candidates numbering 10 times the numbers of vacancies (approx.) in each category will be short listed for Main Examination from the top of above merit list. to answer the Descriptive Test by typing on the computer. The Descriptive Test will be administered immediately after completion of the Objective Test. (i) Objective Test: The objective test of 3 hours duration consists of 4 Sections for total 200 marks. The objective test will have separate timing for every section. Selection criteria for Group Exercise and Interview: Category wise merit list will be drawn on the basis of the aggregate marks scored in the Main Examination. There will be no sectional cut-off. Candidates numbering up to 3 times (approx.) of the category wise vacancies will be shortlisted for the Group Exercise & Interview from the top of the category wise merit list subject to a candidate scoring the minimum aggregate qualifying score. Candidates qualifying for GE & Interview under 'OBC' category would be required to submit OBC certificate containing the 'Non Creamy layer' clause. Candidates who have registered themselves as OBC but do not submit OBC 'Non Creamy layer' certificate and request to be interviewed under General category will not be entertained. candidates will have to qualify both in Phase-II and Phase-III separately. Selection will be made from the top merit ranked candidates in each category. Results of the candidates who qualify for Main Examination and Group Exercise & Interview as well as the final select list will be made available on the Bank's website. total compensation per annum on CTC basis be a minimum of 8.20 lacs and maximum of 13.08 lacs depending on place of posting and other factors. Interested and eligible candidates can apply online only from 02.04.2019 to 22.04.2019. No other mode of application will be accepted.